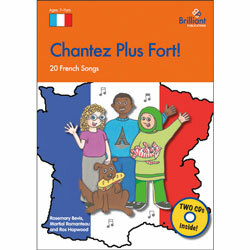 Singing French is a must-have collection of fun new songs and chants for practising vocabulary and phrases when learning French. These catchy songs and chants help pupils memorise the words, and the upbeat backing tracks will appeal to 7-14 year-olds. This resource also includes teaching ideas for activities and games to go with each song and chant, together with photocopiable resources. Full Teachers' Notes are provided. Includes teaching notes, activities for using and developing the vocabulary and follow-up work. Clever use of repetition, rhythm and melody commits new vocabulary and phrases to memory. Singing French has been developed for use with children at primary school or lower secondary school (Key Stage 2 & Key Stage 3, 7-14 year olds) who are beginners to the French language. An audio CD is included so no music reading is necessary. KS1 love the songs about numbers. Years 5,6 and 7 think the ones about monsters and football are terrific . You'll have a noisy session for the football song though!